As an artist there is a need for affirmation and justification for one’s life in the activity and practice of artmaking. Artists prepare and curate their work in gallery exhibitions to present work – and then there are awards and competitions. Each year, as the call for entries comes around, we like many artists around the country, look at recent work and consider its appropriateness for specific awards. There are of course thoughts of winning an award but perhaps more importantly is the opportunity to be shortlisted for exhibition and considered for purchase or collection. Equally important for us is the opportunity to connect with fellow artists in the curated exhibition that represent the judge’s opinion of what constitutes the most relevant works based on the competition’s criteria. This year I submitted to the National Works on Paper Award an artists’ book that I had made during our Skopelos Works on Paper workshop in Greece last year. The book is an exploration of the idea of a montage of light capturing the performance of reading a book. 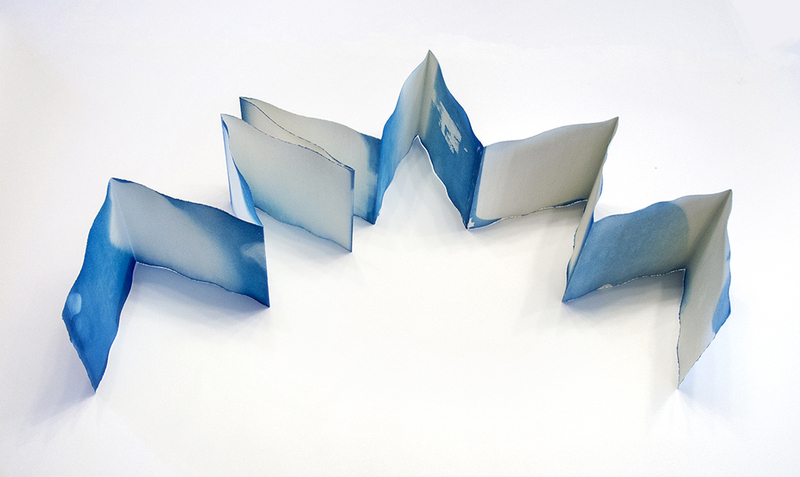 Simultaneously the reader, the location where the reading took place and the page-turning action of reading is imaged in light sensitive cyanotype on the watercolour pages of the book. This book is created using the cyanotype (sun print) process as part of the author’s ongoing investigation on the ontology of reading. The book was folded into a concertina form to eventually allow for a variety of potential readings; either extended or page after page. 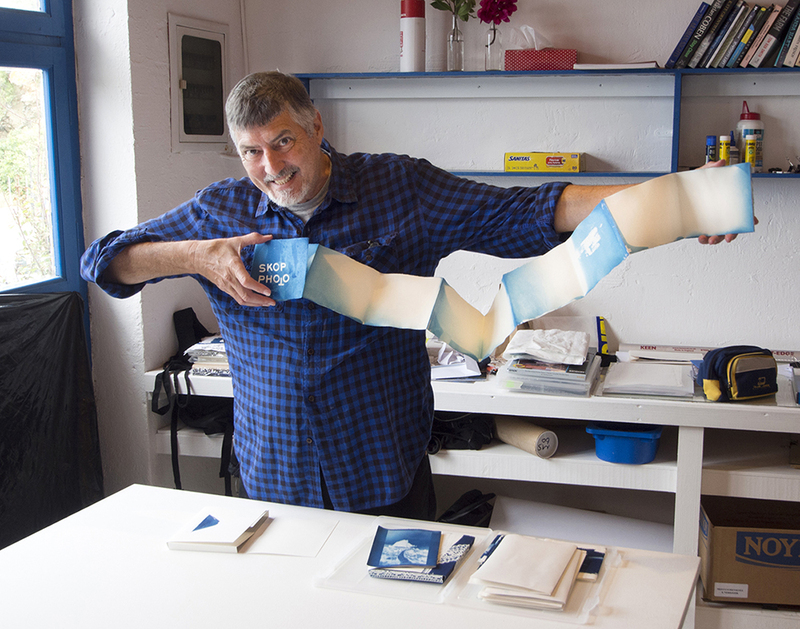 The author then coated the light sensitive cyanotype emulsion onto the pages of the book. The pages were slowly turned and extended over several minutes allowing the sunlight of the Greek island of Skopelos to strike the emulsion as author performed reading. After washing in a bath of water, an image of the Aegean light was formed in Prussian blue on the pages of the book. Alternatively, where the light had not fallen on the page – there seemed to be no image formed. But this apparent absence was a “shadow” – a kind portrait of the artist reading the book in its moment of creation. 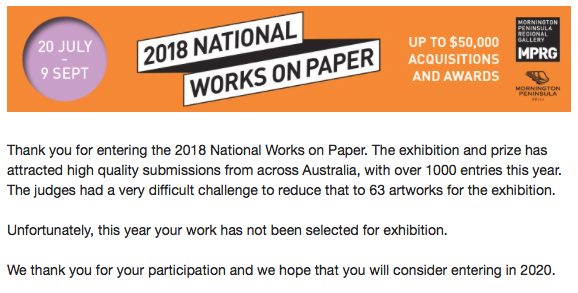 Today I received an email advising that my submission was not shortlisted..
Not a big problem for me as only 1 in 16 artworks were accepted for the 2018 awards and those names on the list are a fine group of artists. Raymond Arnold, Peter Atkins, Alec Baker, Martin Bell, Ray Besserdin, Solomon Booth, David Bosun, Godwin Bradbeer, Kate Briscoe, Jane Brown, Jon Campbell, Susanna Castleden, Danica Chappell, Hua Cun Chen, Sam Cranstoun, Lesley Duxbury, Robert Fielding, David Frazer, Ian Friend, Dana Harris, Katherine Hattam, Pei Pei He, Kendal Heyes, Mark Hislop, Deanna Hitti, Anna Hoyle, Natalya Hughes, Alana Hunt, Locust Jones, Jennifer Joseph, Noŋgirrŋa Marawili, Brian Martin, Georgie Mattingley, Mish Meijers, Viv Miller, Helen Mueller, John Nixon, Open Spatial Workshop, Elena Papanikolakis, Louise Paramor, Hubert Pareroultja, Jemima Parker, Riley Payne, Dan Price, Lisa Reid, Louise Rippert, Cameron Robbins, Brian Robinson, Elissa Sampson, Emily Sandrussi, Geoff Sargeant, Jo Scicluna, Liz Shreeve, William Smeets, Kylie Stillman, TextaQueen, James Tylor and Laura Wills, Trent Walter, Rosie Weiss, Mumu Mike Williams, Puna Yanima, Yvonne Zago, Tianli Zu. The opening event and award presentations will take place on Saturday 21 July from 4-6pm. An electronic invitation will be sent to you closer to the date.